I’m really excited to finally receive a copy of Do Muslim Women Need Saving? by Lila Abu-Lughod. I’m looking forward to read the book because Abu-Lughod is an excellent writer on issues relating to Muslim women. 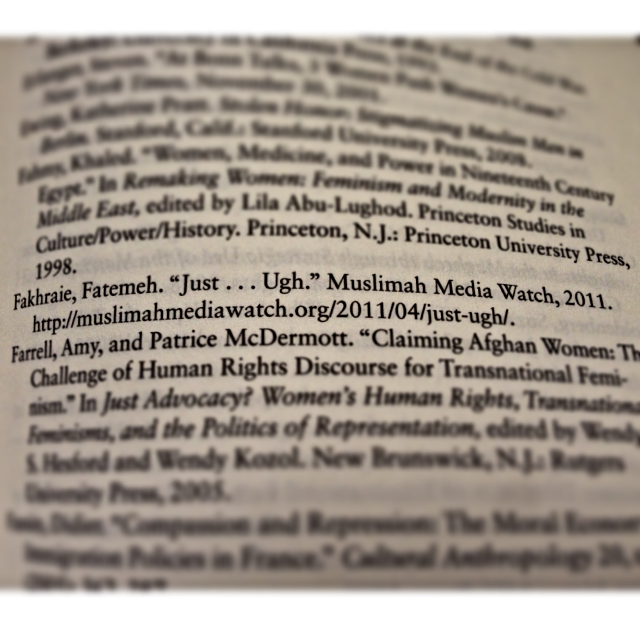 But I’m also really jazzed because, as you can see above, a piece I wrote for Muslimah Media Watch (MMW) appears in the notes (page 287, to be exact). The idea that Abu-Lughod used something I wrote on a blog I created to critically analyze Muslim women’s media representation is incredibly humbling. And also incredibly affirming. After leaving the site in 2011, I’ve done a fair amount of stepping back from the world of Muslim feminism. Not ideologically, of course, but professionally. Five years of learning, writing, working, collaborating, arguing, and speaking on Muslim women’s issues was fantastic, mind-expanding, empowering, and fulfilling. But it was also exhausting. Primarily because my writing alone was not a money-making venture. But also because repeating and explaining the same truths over and over for five years was draining, and every time I had to patiently explain that Islam is not oppressive or that Islam and feminism are not mutually exclusive, I got a little more tired. And eventually, I realized my exhaustion impeded my ability to effectively run MMW. Which really didn’t matter; I left MMW in the most capable hands, and every so often I marvel at what the site has become and thank God that I made the decision to pass it on instead of just shut it down. So at times like these, when I see that MMW has been used as a resource for an academic publication, that I reflect on how much work we all did (and do) at MMW. It’s so gratifying to learn that our blog is used in my old women’s studies classes at Oregon State University or in a guide for evaluating media resources to use in the classroom to teach about current events and Middle Eastern culture at my alma mater, the University of Utah. The wonderful thing is that MMW’s influence doesn’t just stop with me. The site has so much talent that goes on to do such wonderful things. MMW isn’t responsible for the outstanding work Ethar El-Katatney does at Al Jazeera, the thought-provoking work Kirstin Dane writes for The Huffington Post, or the fantastic pieces Sara Yasin writes for Policy Mic, but I’m so proud to know that MMW was a stone on their path. That’s exactly what I wanted for MMW, and I look forward to seeing our talented writers climb to even higher heights. Do we need saving? Spoiler alert: hells, naw. We’re already doing it for ourselves. ← Are you into comic books?